Jeremy Thiel works closely with his sister and brother so it’s a family affair just like us! Jeremy specializes in group instruction, youth coaching and adult training. His expertise covers general sports conditioning, sport specific skills and speed/agility training. He’s coming to talk with us and our kids about simple things we can have our kids do or things we can all do together to build strength and flexibility. 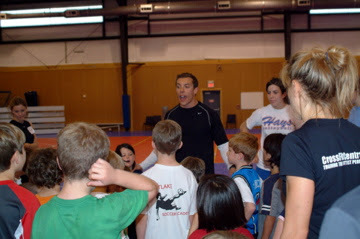 He also is really good at instructing kids and parents about simple things we can do daily to stay fit.